A hardworking young girl who's often bullied by her stepmother and stepsisters. She is one of the princesses needed to open the final Keyhole, and was captured by the Heartless. Her world has already been destroyed. Prince Charming first swept her away in "Cinderella" (1950). A young lady who believes dreams can come true. Lady Tremaine and her daughters seem determined to make her life a misery, but Cinderella endures it with grace. She and Jaq the mouse are good friends. Lady Tremaine and her daughters tore apart her dress for the ball, but was soon visited by her Fairy Godmother, who used magic to provide her a coach and a new dress. She caught Prince Charming's eye at the ball but had to flee the palace at the stroke of twelve, before the magic wore off. When brought together, seven hearts of pure light, like Cinderella's, are the key to ruling all worlds. A young lady who believes dreams can come true. "Why....it's a dream come true!" Cinderella is one of the classic Disney characters who appears in Kingdom Hearts, Kingdom Hearts Birth by Sleep and Kingdom Hearts Union χ. The main character from Walt Disney's 1950 film Cinderella, she plays a small but important role in the game as one of the Princesses of Heart. Maleficent destroyed her world and took her into captivity as well. Cinderella appears due to the Book of Prophecies. Cinderella thanks both Ventus and Jaq for creating her dress. Cinderella was born a wealthy girl, but after her mother passed away while she was still young, her father remarried another woman, Lady Tremaine, to care for Cinderella. However, after her father passed away too, her evil stepmother revealed her true self and turned her into her own home's maid. 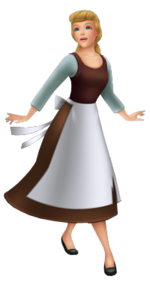 Cinderella is abused by being treated like a slave and is given ridiculous amounts of chores, as it is implied Tremaine does so to punish Cinderella as opposed to caring so much about the cleanliness of the house. [please confirm] Tremaine also gives preferential treatment to her daughters Anastasia and Drizella, as well as her cat Lucifer. Cinderella's only friends are the animals and the mice of the house. One day, the King of the Castle of Dreams holds a ball for Prince Charming invites all unmarried women from the kingdom to help him find a bride. Instead of letting her join them, Lady Tremaine and her daughters give her unfinished chores to prevent her from getting ready for the ball. During Ventus's visit, he assists her mouse friend, Jaq, in making a dress for her while Cinderella finishes her chores. Despite his appearance, Cinderella somehow believes Ventus to be a mouse due to his unexpected miniature size. Cinderella is escorted by Terra. Cinderella's stepsisters angrily tear apart her dress. Cinderella runs to the garden in tears just as Terra arrives, who tells her that strength of heart will help her get through the hardest trials. After he protects her from Unversed, her Fairy Godmother helps her make a beautiful princess gown and a carriage to take her to the ball, with Terra as her bodyguard. While at the ball, she meets the Prince and they fall instantly in love with each other. While dancing, she and the prince are suddenly interrupted by a gigantic Unversed until Terra comes to their rescue. After the Unversed is defeated, the clock strikes midnight and Cinderella is forced to leave the ball before the Fairy Godmother's magic runs out. As she runs through the Grand Hall, she loses a slipper. Prince Charming declares to find the girl of his dreams with the glass slipper by letting every girl in the kingdom try it on. Lady Tremaine, having discovered that Cinderella is the girl at the ball, locks her in her room and attempts to make one of her daughters the Prince's bride. Cinderella being invited by Aqua to try on the glass slipper first. However, Aqua and Jaq cooperate and manage to free Cinderella just before the Grand Duke is able to leave. Lady Tremaine trips him and the slipper breaks to pieces before she is able to try it on, but Cinderella pulls out the second glass slipper from her pocket and uses it to replace the broken one. The Grand Duke is about to take her to the castle when Lady Tremaine's negativity summons the gigantic Cursed Coach Unversed to murder the princess, since she is now free. Aqua manages to destroy it and bring her safely to Prince Charming. Charming is at first surprised to see that Cinderella is in fact a servant girl as opposed to the princess he believed her to be, but nevertheless accepts her for who she is. Some time after Xehanort's defeat, she is dancing around the ballroom with the prince while Jaq and the Fairy Godmother look on. However, the castle from her world was later found by Aqua inside the Realm of Darkness. Eventually, Castle of Dreams was consumed by the Heartless. Cinderella was taken and held deep within Hollow Bastion until all seven Princesses were collected. When Sora is in his Dive to the Heart, he sees a stained-glass likeness of her depicted on top of a blue-colored pillar. Once her heart was restored after Sora selflessly sacrifices himself using the Keyblade of heart, she stays behind in the castle of Hollow Bastion with the other five princesses to hold back the darkness lurking out of the Final Keyhole, until Sora returns and closes it. Though the Final Keyhole is sealed, Cinderella and the others feel another dark power approaching from somewhere else (End of the World where Kingdom Hearts is held), and asks Sora to stop Ansem, Seeker of Darkness from fulfilling his evil plans while they remain behind to protect Hollow Bastion. When Kingdom Hearts is sealed, she returns to her own world. Cinderella in her raggy maid outfit. Cinderella has fair skin, long, blonde hair, and blue eyes. When dressed in her maid outfit, she wears a brown dress, a long-sleeved, pale blue undershirt, black shoes, and a white apron. She also ties her hair into a ponytail. 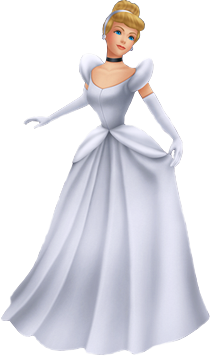 When in her ball attire, Cinderella wears long, white gloves that reach to halfway up her upper arms, as well as an elegant, flowing, white dress. The straps of this dress sport puffy disks decorating them. She also wears a white headband, white earrings, and a black choker. Though usually hidden by her dress, Cinderella wears her famous glass slippers in this outfit as well. She also ties her hair into a bun. In the original Kingdom Hearts, Cinderella wears this outfit, albeit her hair and dress are brighter in color. In her Awakening emblem, Cinderella's hair is brown and her dress has a slight blue tint. Despite Kingdom Hearts Birth by Sleep being set ten years before the original Kingdom Hearts, Cinderella appears unchanged. Cinderella has been known to be a very hardworking and honest young woman, who is skillful in doing multiple house chores each day and cooking as she constantly serves her stepmother and two stepsisters. She is not afraid to speak her mind and her dreams to her mouse friends, yet is completely passive and obedient to her step-family right until she goes to the ball. Cinderella is frightened by Lady Tremaine, concerned that if she does not follow Tremaine's orders or upsets Tremaine too much, she will be punished and potentially end up in a worse place. She has shown kindness to everyone around her, including her mouse friends and even to her harsh stepmother and mean stepsisters. Cinderella's dream is to leave Tremaine's residence and find a happier place to live, and does her best to cope with her unfortunate living circumstances. She is shown to have unwavering patience and perseverance that has helped her, even when her first dress was destroyed by her stepmother and stepsisters and she seemed to have lost all hope. It was her strong belief in her dreams that allowed the Fairy Godmother to come and help her get to the ball. Because Cinderella is a Princess of Heart, her heart holds part of the ability to open the Final Keyhole that leads to Kingdom Hearts, which can only be opened when she is joined with the other six princesses. Should her heart be lost, her body will remain in a dormant state until it returns. She also has the power to hold back darkness using the light stored within her heart, a power which she and the other princesses can utilize alone (the exact way she fights off darkness is currently unclear). In addition, her heart (along with that of the other princesses) can be used to create the Keyblade of heart, which allows the bearer to unlock anyone's heart. Cinderella (along with the other princesses) can also upgrade other people's powers, as revealed when they upgraded Sora's Fira spell to Firaga. She can also locate darkness, as shown when she and her fellow princesses tell Sora about a great darkness approaching nearby. In Kingdom Hearts Birth by Sleep, Cinderella becomes a D-Link for Terra, Ventus and Aqua separately after the events of her world, able to send them her power to assist them in battle. Terra and Cinderella have a Finish move called “Dream Waltz”. Aside from Cinderella, her fellow princess, Snow White becomes one as well for Aqua and Ventus. While in link with Cinderella, the characters can lift enemies up into the air with magic and temporarily immobilize them. They can also make a powerful vortex to blow away their enemies. Cinderella in Lady Tremaine's room. Inspired by the title character of the folk tale Cinderella, specifically, the French fairy tale Cendrillon by Charles Perrault, Cinderella first appeared in the tale's Disney animated adaptation. She was born wealthy, but after her father passed away, her evil stepmother, Lady Tremaine, turned her into her own home's maid. When the King of the Castle of Dreams announces a royal ball, Cinderella wishes to go, but her stepmother and stepsisters tell her that if she finishes her chores (of which there are many) and procures a dress, then she can go. Her mice friends fashion a dress while she does her chores, but her stepsisters, under Lady Tremaine's provoking, destroy it. In despair, Cinderella weeps, but is confronted by her Fairy Godmother, who provides her the means to go to the ball with magic, but not before warning her that the magic wears off at midnight. At the ball, Cinderella attracts the attention of Prince Charming, but is forced to leave at midnight and leaves her slipper behind. The following day, Prince Charming leads a search throughout the kingdom for the maiden that fits the slipper. Back at home, Lady Tremaine realizes that Cinderella was the woman who danced with the prince and locks Cinderella in her room. Her mice companions break her out, and she goes to try on the slipper. Despite Lady Tremaine's efforts to destroy the slipper, Cinderella reveals that she has the other slipper, and afterwards lives happily ever after with Prince Charming.